Phosphorescent Glow in the Dark. 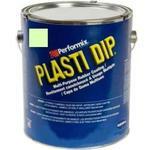 Colour Lime/Yellow Litre Plasti Dip Non-UV Multi Purpose Flexible Rubber Coating, Brush-on, Dip or Spray. Plasti Dip Phosphorescent charges with light during the day and emits the light in the dark. For best results charge with strong light or sunlight. Surfaces which are non-absorbent such as metals should be primed using our recommended Primers which are available in Clear colour. For coverage and other technical information, please refer to our Technical and Manufacturer's Safety Data Sheets. Glow in the Dark Tea Shirt. Glow in the Dark Light Globe.